Three Stars: An entertaining mystery for middle grade readers. It is the first day of high school for the plucky, precocious, semi goth girl, October. Today she is starting at her new school in Sticksville and she is especially nervous because she is only thirteen, a year younger than her peers. She hopes that no one will learn her actual age. Anxiously, she shoulders her backpack and meanders past the old cemetery adjacent to her house. While others may be a little jittery living next door to the graveyard, October is intrigued by the crumbling headstones and tranquil atmosphere. Alas, school calls; head down she ducks through the congested halls hoping to go unnoticed and somehow endure the day. No such luck; sandwiched beside her locker is the resident queen bee, Ashley and her swarm of drones. Ms. Popular sneers her direction and immediately dubs her "zombie tramp". So much for coasting through her debut at Sticksville. October withstands the day and she even makes a couple of friends. She might just survive after all. The days begin to pass by and afternoons are soon spent scribbling away on her horror novel in the graveyard. Then her favorite teacher Mr. O'Shea is killed in an untimely accident, crushed by the lift in the auto shop. October has a nagging suspicion that his death was no accident. Somehow she manages to accidentally summon five ghosts and The Dead Kid Detective Agency is born. The question is was her teacher murdered and if so by whom? Can the dead kids and October solve the crime? *The tone of this book will appeal to the middle grade readers. It is slightly sarcastic and witty. An abundance of funny aside commentary will surely generate some snickers. *There are plenty of humorous illustrations dotted throughout the pages. It has definitely been awhile since I read a book with pictures. Leading me to wonder, why aren't more adult books illustrated? I like the visual depictions of the scenes. *The characterization in this book is fun. October is adventurous, resourceful, a bit of an underdog and she has a quick wit. The five ghosts are all from unique time periods and ethnic backgrounds. It was fun watching them navigate in our time and experience them trying to learn the ropes of modern day technology. *I enjoyed the depiction of some of her teachers, as we know educators are varied and often eccentric. Mr. Santuzzi was especially funny with his bad clothes, suspicious hair ( was it a toupee or not?) and military style of teaching. Meeting her teachers certainly gave me flashbacks to my own school days. *The plot keeps you guessing. I honestly spent most of the book trying to figure out the mystery. The story will lead you to one suspect, only to steer you on a detour to another. There are some twists and surprises along the way. A lively, little mystery. *I struggled with this book being labeled as a middle grade novel. While some parts would appeal to the younger crowd they were many aspects that led me to believe that this was more suited for a more mature reader. For instance the book is set in high school, which of course presents many issues that are pertienent for that age group. It would be better if October was in junior high, more relatable for the target reader. One plot revolves around a terror cell in Quebec that operated during the late 1960’s; that in my opinion is subject matter that is a little over the head of younger readers. There was a scene that involved some teenage drinking and smoking, again material for an older reader or preferably not at all. *This book starts out with a first person narration, October’s view point but the author couldn’t seem to make up his mind, he switches to third person narrative and then it is back and forth, which is distracting. Then there were these diary entries from a frenchman in the late 1960’s. The first time one popped up I was definitely confused. After awhile it made sense as to why they there written into the plot but I do not feel that it integrated smoothly into the story. Personally, I was a somewhat bored with the journal pages. *The story presented several intriguing story lines, such as the mystery surrounding the disappearance of October’s mother when she was three. The early introduction of the missing mother indicated that it would be a story line followed to the end. Instead it is left hanging at the end of the novel for completion in a future book. If the author was not going to finish the story line then why bring it up in the beginning? He also introduces each of the dead kids and discusses the strange circumstances surrounding their deaths. Not one of the ghosts knew the specifics of their demise. It is hinted that this will be answered in future novels but I wanted at least some answers in this book. 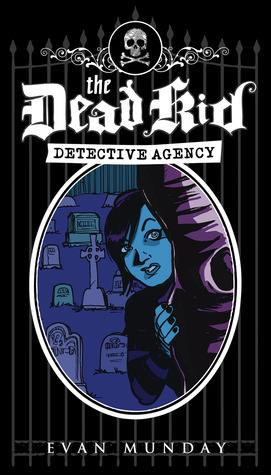 The Dead Kid Detective Agency is a witty introduction into a series for middle grade readers. While the book does have a few problems it is still an enjoyable read. However, I think it is best suited for older middle grade readers. It is quirky and funny and October and the dead kids are like able characters. It will be fun to see where the series goes from here. Sign into Goodreads to see if any of your friends have read The Dead Kid Detective Agency. 25.0% "this is not going well :("
Sounds like fun...though I'm a little disturbed by "zombie tramp" in a MG novel. Wendy Darling wrote: "Sounds like fun...though I'm a little disturbed by "zombie tramp" in a MG novel." yeah and I was not thrilled about smoking and drinking either it really almost falls out of the middle grade category. that is what I thought not good.